Just wanted to let you know that the shipment arrived last Saturday with no stops en route. Thanks for the rapid service! This product is really great. 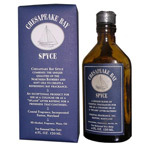 When I wear the Chesapeake Bay Spyce people always tell me what a pleasant aroma it gives off. Look for future orders and please let me know if you ever have special offers for it.